If you are searching for the look of ageless skin with a more even skin tone that has a smoother, firmer finish, Intense Pulse Light (IPL) Therapy is what you are looking for. Utilizing a broad band of light and intense pulses, IPL permits the effective resolution of facial redness or flushing as well as improvement of photo-aged skin damage. Q: HOW DOES INTENSE PULSE LIGHT (IPL) THERAPY WORK? A: IPL is a broad spectrum of light. This intense pulsed light selectively targets broken blood vessels and irregular pigmentation with minimal effect to surrounding tissue. The intense pulsed light energy is absorbed by the broken blood vessels, also called telangectasia, or the darkened pigmentation of the skin. The energy is converted to heat, damaging the targeted blood vessel and pulling hyperpigmentation to the surface of the skin. Damaged blood vessels will be absorbed by the body while the hyperpigmented skin will flake off during the exfoliation process. Q: WHAT TYPE OF SKIN CONDITIONS DOES INTENSE PULSE LIGHT (IPL) THERAPY TREAT? Q: HOW DOES IPL WORK TO REDUCE EARLY SIGNS OF AGING? A: Selectively targeting areas of hyperpigmentation such as age spots, sun spots or liver spots reduces the appearance of “aged skin” resulting in a smoother, younger more youthful look. Collagen formation is also enhanced creating a reduction of fine lines and wrinkles. Areas of broken blood vessels, rosacea, and redness will also be resolved creating a smooth and more even complexion. Q: HOW CAN I ENHANCE THE RESULTS OF AN IPL TREATMENT? A: Most skin damage occurs from sun or UV ray exposure. A daily application of SPF 35 or above will help to minimize the effects of sun exposure reducing damage. IPL treatments combined with MicroResurfacing will propel results by removing the dead skin cells of the topmost layer. While the IPL “pulls” areas of pigment to the surface the DermaSweep™ will exfoliate these unwanted cells. 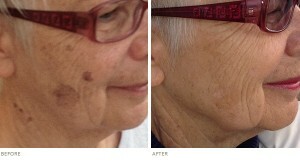 This combination treatment therapy will accelerate results of a smoother more even skin tone. A: You will be wearing a pair of black out glasses as the IPL emits a bright light. You may feel a warm sensation as heat builds in the targeted tissue. When the pulsed light is absorbed in the target you may feel a slight pinch or snap like a rubber band. Most clients find IPL treatments to be completely tolerable. A: We schedule an hour to treat the facial area. If larger areas are being treated then the time will be adjusted accordingly. Combination MicroResurfacing will be performed to the area and usually takes about 30 minutes. A: Your skin will have a pink glow after the treatment and needs to be protected. We recommend an SPF 35 on a daily basis. You can return to work or resume your normal activity immediately. A cool compress may be applied if the area feels warm to the touch. A light covering of make up can be applied if desired. A: Results are dependent on the skin condition being treated. A series of 5 treatments are recommended spaced 4 weeks apart with a MicroResurfacing treatment done in between. An accelerated program may be right for you. After an evaluation is performed by your medical professional, an appropriate skin care plan will be formulated. Results are protected with daily use of sunscreen and a skin care regimen designed for your specific skin type.